A reminder of this Wreaths Across America fundraiser for our cadets. 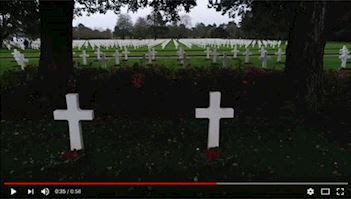 I just returned from a wonderful weekend where I witnessed, for the first time in history, veterans’ wreaths being placed on the graves of every American hero at the Normandy-American Cemetery in France. 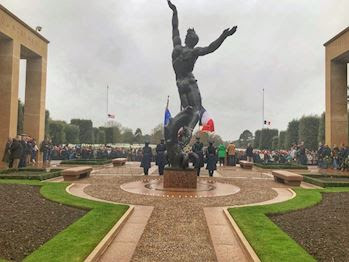 The lives touched by those lives given were demonstrated not only by Americans laying wreaths but also from people that had traveled from all over Europe to participate. You are an important part of the journey from the first wreath laid at Arlington National Cemetery over 25 years ago to the most recent wreath laid in Normandy this past weekend. When you sponsored 4 wreaths in 2017 for San Francisco National Cemetery at Presidio and supporting CA0142P – United States Naval Sea Cadet Corps Arkansas Division, you joined with thousands of others in our mission to Remember, Honor and Teach across our Nation and now across an ocean. Sometimes the impact of a gift like yours is best demonstrated in the simplest of stories. 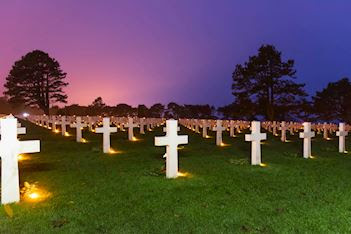 As our founder, Morrill Worcester, walked among the fallen in Normandy, he discovered the gravesite of Lawrence Olson from near Morrill’s home in Washington County, Maine. Lawrence enlisted in the U.S. Army on November 11, 1942, and served as a Private First Class, 120th Infantry Regiment, 30th Infantry Division. When he was killed in action, he was noted as being single and without dependents. Now 76 years later, Lawrence was honored and remembered by a man and a wreath from his home county; His name spoken aloud once more and his story continuing into a new generation. If you would like to witness, first-hand, the meaning of your sponsorships, we would be honored if would join us as a volunteer for National Wreaths Across America Day on Saturday, December 15, 2018. Click Search Locations to find the cemetery that is best for you and your loved ones. 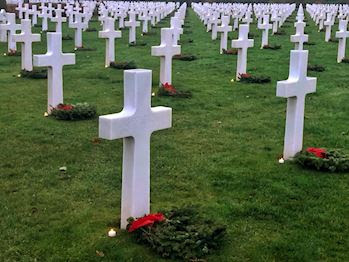 For the very first time, Wreaths Across America, along with volunteers from Kansas, Maine, Texas, Ohio and Maryland, and from countries like Ireland, France, Germany, and the Netherlands came together to place veterans’ wreaths for our American heroes at Normandy-American Cemetery in France. 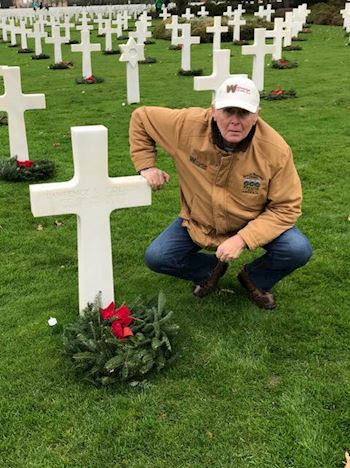 2018 is the first year Wreaths Across America has placed our Maine-made wreaths on foreign soil, by traveling to Normandy-American Cemetery in Colleville-sur-Mer, France. Our founder, Morrill Worcester, personally donated the 9,387 needed to honor each person buried there. WAA founder Morrill Worcester places a fresh, live balsam wreath at the gravesite of Lawrence Colson from Washington County, Maine. Lawrence served as a Private First Class, 120th Infantry Regiment, 30th Infantry Division, U.S. Army during World War II and was “Killed In Action” in France. 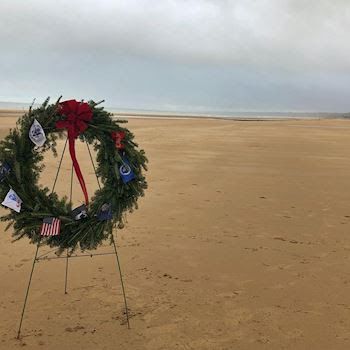 During our recent trip to remember American heroes interred in Normandy, WAA had the honor of placing a wreath on Utah Beach, one site of the D-Day Landings on June 6, 1944. In a moving ceremony, Wreaths Across America supporters gathered in the wind and rain to honor the men and women who died overseas while advancing the cause of freedom during WWII. Whether at Arlington, in our hometowns or on foreign soil, Wreaths Across America is continuing to work towards one day honoring all of our heroes and we hope you’ll join us. This entry was posted in Wreaths Across America and tagged Wreaths Across America on December 7, 2018 by Michael K. Barbour.